Let’s imagine you’re stranded on a deserted island. You know…palm trees, water, coconuts and solitude. You received forewarning of your trip. Yes, a bit unusual, but let’s go with it! Because of this forewarning you were allowed to choose one food item to take with you. You could pick anything! What would it be? Chocolate, coffee, cheese (probably not very practical, but very yummy! ), kombucha? My top pick would be the humble, little bean that’s easily ignored in the name of being bland and too simple: dried black beans. Hey, I like the underdog in life, because sometimes that underdog is secretly amazing! A deserted island trip is the only way I could enjoy black beans at every meal, forever and ever! In an effort to convince my family that black beans are an essential everyday meal, I’ve been working on slowly introducing new meals with this underrated food. Because of this effort I’ve learned two very important keys to food persuasion. Moms, listen up! 1. Flavor. The moment a dish lacks flavor your food cause is lost! On the other hand, with the right flavor you can make just about any food an instant success, including beets and deviled eggs! 2. Versatility. The more ways you can use an ingredient, the better. Get creative and start adding your mission impossible ingredient to a variety of recipes. Toss together a handful of fresh cilantro, salt, and a couple of choice vegetables, and black beans are easily transformed from “Do we have to eat these, Mom?” to “Can we have these again, please? ?” Flavor is a powerful tool! Use it to your advantage. Once a large pot of black beans has been prepared they can be stored in the fridge or frozen and used to make a variety of real food meals: quseadillas (and who doesn’t love tortillas, cheese, and beans? ), nachos (always the right answer! ), taquitos, beans and rice, burgers, and even soup! Black beans are one of the most versatile foods ever. And I’m not just saying that because I’m slightly biased or blinded by black bean love. Today, I have good news. I won’t be arranging a deserted island trip, but I can help you persuade your family that black beans are an essential everyday food. 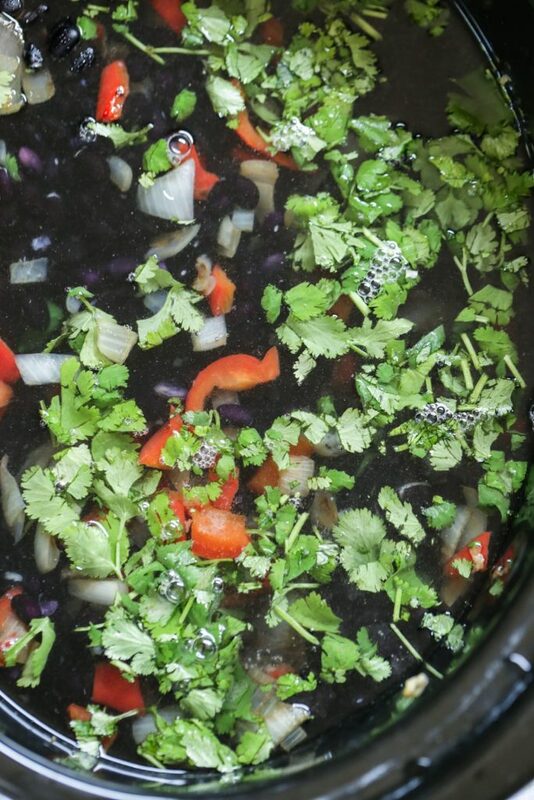 To start, let’s go with a simple and healthy black bean soup recipe. 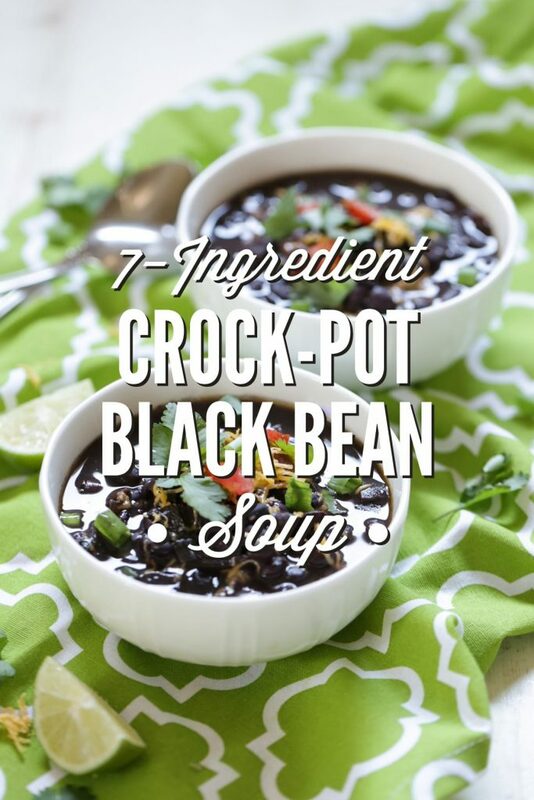 This easy 7-Ingredient Crock-Pot Black Bean Soup is made with, as the name describes, just seven real food ingredients. 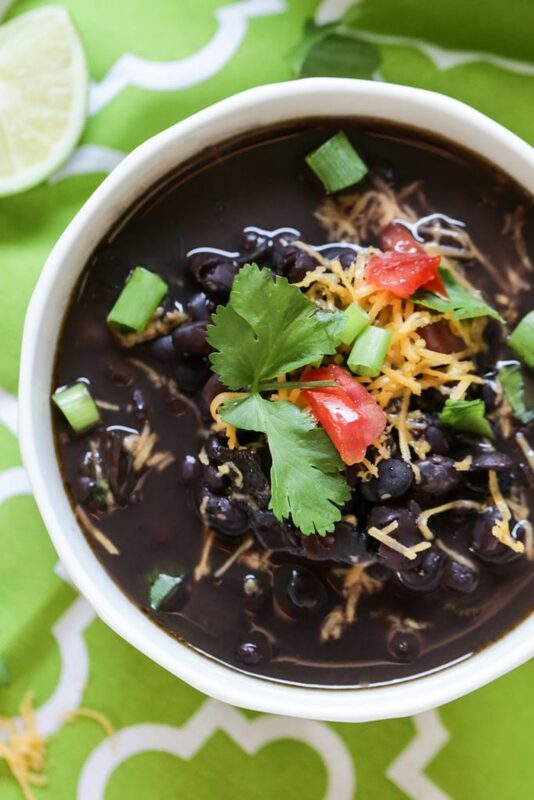 Each ingredient is probably already sitting in your fridge and pantry which means your family’s black bean obsession can start today! Not only is this soup made with just seven ingredients, it’s also a saute’ and dump in the crock-pot recipe. The end result is a time-saving, nourishing soup that packs fresh flavor with each new bite. 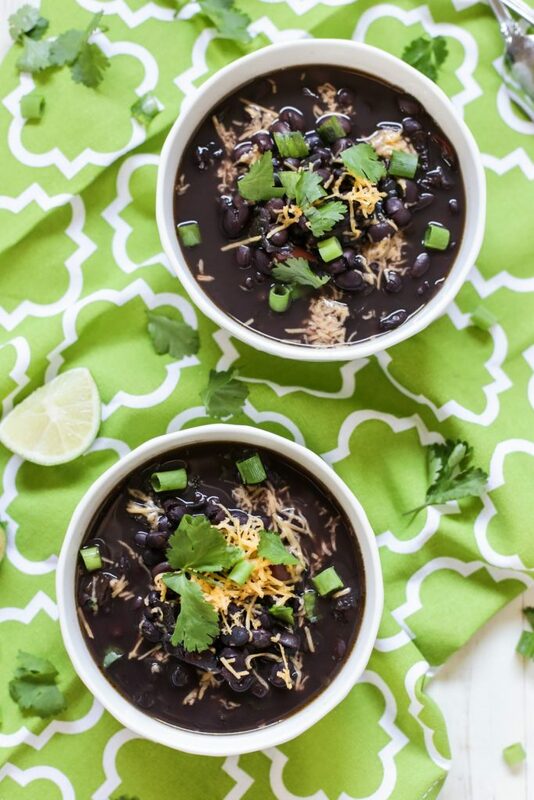 Essentially, this soup is an effortless bowl of the best food ever: black beans! Top this soup with your favorite ingredients, and watch your family beg for more. 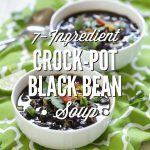 This easy 7-Ingredient Crock-Pot Black Bean Soup is made with, as the name describes, just seven real food ingredients. 1 TB extra virgin olive oil this little addition isn't counted in the "7." Coconut oil or butter will also work just something to grease the pan and veggies. In a large skillet, over medium-high heat, heat the olive oil. Add the chopped onion and red pepper. Saute the vegetables for 4-5 minutes, just until the onions are translucent. Add the minced garlic and stir for 1 minute, until the garlic is fragrant. Pour the black beans into the crock-pot, followed by the the pepper and onion mixture. Add the salt and broth. Stir the soup ingredients to combine. Cook the soup in the crock-pot for 8 hours on low or 4 hours on high. Once the soup is done (the beans are soft), stir in the 1/2 cup of cilantro. 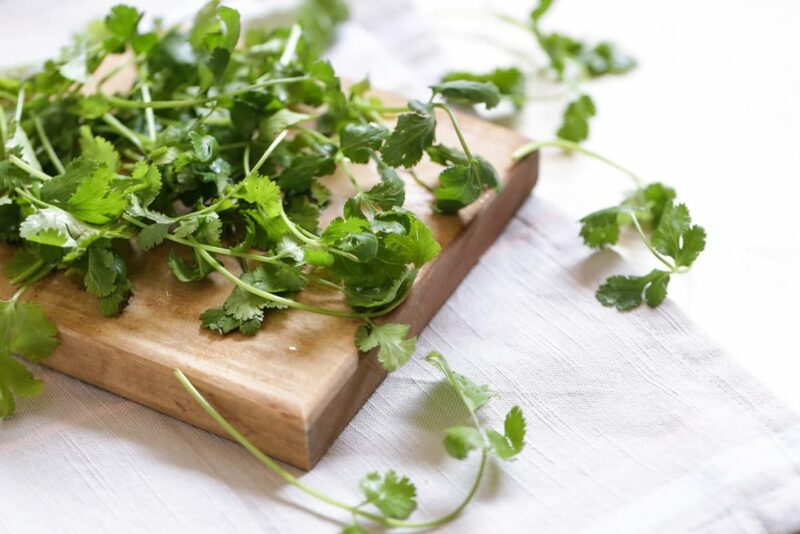 Originally, the recipe called for adding the cilantro before cooking the soup, but I've found the best flavor comes from adding the cilantro after cooking the soup. If you'd like, stir in the juice from one lime, too. Serve warm with fresh cilantro, sour cream, rice, tomatoes, cheese, avocado, or salsa--this is where lots of additional flavor will come from. The soup alone is very basic and meant to be served with toppings. You can also drain a portion of the beans to use for nachos, quesadillas, or tacos. 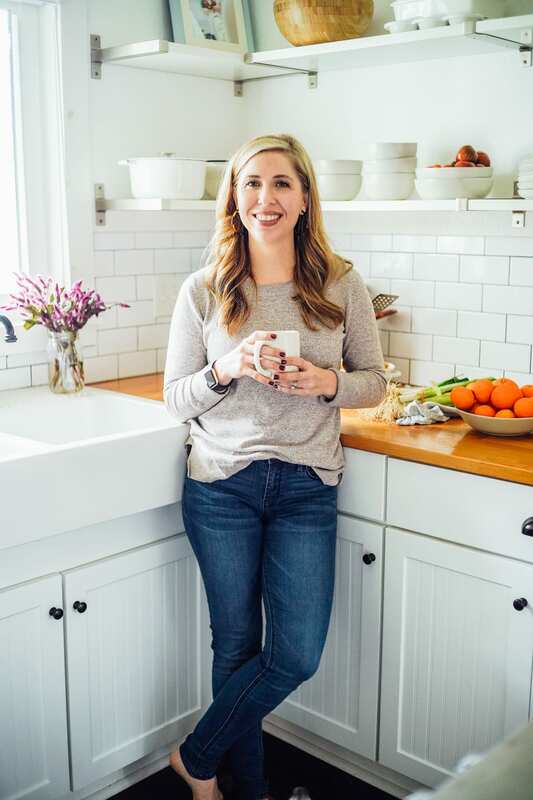 Find all my favorite kitchen tool essentials, here. *Soaking Directions: In a large bowl, soak 3 cups of dried back beans in 8 cups of water. Cover the bowl with a towel (to keep bugs and dirt out). Soak the beans for 8-12 hours (overnight). After the soaking, drain and rinse the beans with fresh water. 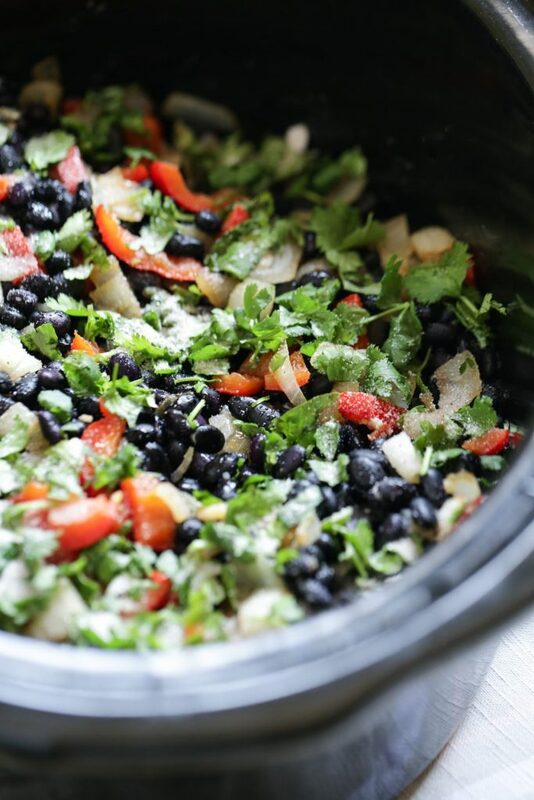 You will have 3 cups of soaked black beans to add to the crock-pot. Vicky, That’s a fantastic idea!! I would add a bit more broth/water (maybe a cup?) to compensate for the ham that will fall off the bone. Enjoy!! I just saw a recipe for black bean brownies on the Pioneer Woman/Tasty Kitchen web site; so you could easily have chocolate and black beans on your island. Happy Thursday. Yum! That’s my kind of island! 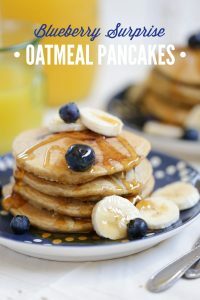 Thanks for this recipe Kristen! 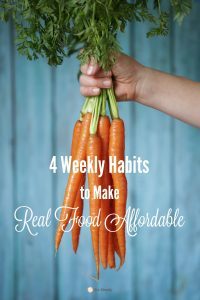 I’m all about cheap, healthy meals that don’t take long to prepare. I need to look into more crockpot and freezer meals… I keep telling myself that, but I’m still not getting around to it… lol! One – when you freeze extra back beans, do you freeze them in their liquid or do you drain them and freeze only the beans? When I get busy I find myself (secretly and shamefully) buying cans of beans for our meals instead of using dried beans. I know there are some good brands of canned food, but that’s usually not the ones I’m buying. Two – are there any other foods or things you can do to reduce tummy upset from beans? Maybe that’s a weird question, but I love cooking meals with beans. Unfortunately they don’t always agree with everyone’s tummy. Hey Meagan, You’re welcome :). I recommend freezing beans with the cooking liquid to keep them from drying out. Usually soaking the beans (for at least eight hours) will help degas them so no one in our family has any tummy issues. I hope that helps! 2. Freeze dry beans along w/ all other ingredients. Hey Dawn, Yes, correct. You can omit the oil since you’re not going to saute, but leaving it in there won’t hurt either. Also, wait to add the broth/water until the day of cooking because that amount won’t fit in a gallon-sized bag. I know this is more of a real food’s recipe, but is there any way canned black beans can be substituted? Hey Anatasia, Yes, I believe so :). I recommend shortening the cook time since the beans are already soft and cooked by half. Enjoy!! I was really excited to try this dish! Unfortunately, after following your directions and allowing the soup to cook all day on low, we rushed home last night to find our wonderfully smelling soup with still tough beans. The beans still had a little bite to them and weren’t soft or creamy like I usually experience with well cooked beans. Any suggestions on what I can do differently next time? Do you soak your beans in hot water? Should I start the crockpot on high and then turn it down to low? I am thinking of trying this meal again on a weekend and cooking it on high to see how that goes. I cooked it on low yesterday specifically since we were at work and needed the all day cook. Thanks for your suggestions. Hey Allie, I apologize for the late response. Two things may help: 1/ Soaking the beans overnight for 12 hours. It’s important for the beans to have enough water so they don’t dry out during this time. 2/Add the salt after the beans are done cooking in the crock-pot. Let me know how it goes! This was my experience, too. I soaked the beans overnight, then followed the receipe with the soaked, drained beans in the morning, and after around 9 hours of cooking in the crock pot on low, they were sorta cooked, but tough and clumpy. The beans were just purchased the day before, so they were not old. Hey Katie, Sorry to hear about your experience. Slow cookers can cook at different temperatures (some run hotter than others), so maybe that was the issue. I would turn up the heat level on the slow-cooker if the cooker typically runs on the cooler side. I was planning to make this very soon and soaked the beans last night. 🙂 Question…if the beans have been soaking for 8 hours and are no longer covered in the water (although still there is water down lower in there), should I a) Add more water and keep soaking until around 12 when I’m ready to cook or b) Leave them in there until then without adding water. or c) Go ahead and rinse them and store them in…fridge? Counter? Until ready to cook. You can see I’m not experienced with soaking dried beans. 😉 But I saw your recipe and was inspired to start using dried beans, it had been on my mind before, and how you had it all laid out in your recipe made it sound in intimidating. 😀 II also wondered if there is another seasoning or two you would recommend adding with the salt. I could be wrong, but feel like I will need more than the salt, as I generally need to cook for more than one seasoning for my tastes. But this recipe could always prove me wrong. 🙂 I realize you may not get back to me yet today, but this can be learning for next time. Hey Rach, This happens to my beans quite often. I usually add more water and allow the beans to finish soaking for a few more hours. I’ve also drained the beans, when I don’t have time for more soaking, and used them as is. Both options always work great. You could add some cumin powder and a couple of bay leaves to the black beans for more spice. I really struggled making the soup. For example, I had 1 pound of black beans, which measured about 2 cups before soaking it and well over three after a 13 hour soak. Is the 3 cups and the ingredients list before or after soaking? I just threw in all of the beans. I made this about seven hours before the latest I wanted to eat dinner, so I started it on low for four hours, then I turned it up to high. Even then, the beans still weren’t done when we wanted to eat. The flavor was just OK, and I’m hoping the leftovers will be better. If not, this will make a good base for things like rice and beans as suggested In the post. The 3 cups is the amount needed before the soak. The beans will expand during the soak, so you’ll have more than 3 cups of beans after a soak. 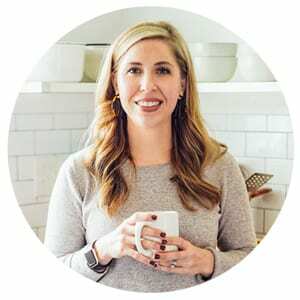 I’ve definitely experienced the issue you express with dry beans (not fully cooking even after a soak and full day cooking) in the crock-pot, even after following a recipe. For me, it’s been important to get to know my crock-pot and know the best way to cook something like dry beans. In my crock-pot, low is still a very “hot” setting (for lack of a better term right now :)), so the beans cook very well after about 7 hours of cooking time. Hopefully the leftovers will be great! This recipe is definitely a base soup, so the big flavors will come from the toppings. Thank you so much for sharing, Carol! Very good advice! Just wanted to say thanks for this- added a bit of extra garlic and woah is it tasty! 🙂 Great option for days we’re out hiking!! Great idea, Mo! I’m glad you enjoyed the soup. That’s awesome, Heidi! Thank you for sharing! Hello 😉 Question…does the size of crockpot make a difference for the suggested cooking time? I have a 6 qt size crockpot, do you suggest 8 hours in that size? Or was that time for a 4 qt size? Thanks! Hey Marta, The cooking time will be the same for either size :). Enjoy!! Looks so yummy! 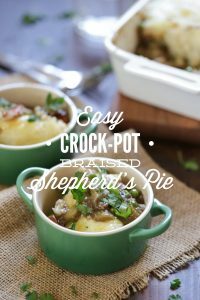 I was wondering if you feel this would work as a freezer to crockpot meal? Hey Tiffany, I definitely think so! I was so excited to try this recipe. 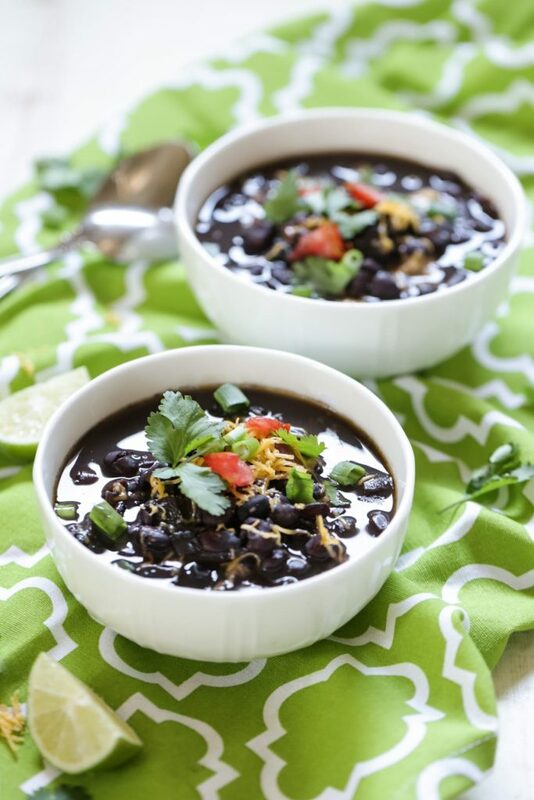 I love black bean soup, and this recipe looked easy. I was extremely disappointed in the flavor. It’s incredibly bland, even with the addition of salt, garlic powder and onion powder. I’m going to try and season it some more, but I probably won’t make this again. Thanks for the feedback, Stephanie! I would love to hear what kind of flavor combos you add to the soup, if you make it again. I served it over rice and garnished it with fresh chopped jalapenos, fresh cilantro, lime, a dollop of Fage fat free greek yogurt, and half an avocado. Very satisfying! My husband and I tend to like things a bit spicier than the kids so I also used a sprinkle of cayenne pepper on mine, easy to add a little more zip. Can’t wait to make this again! I’m so glad you liked it, Cathy! Instead of dry beans could I use canned beans and dry off the water? Hey Becca, Sure, you won’t need to cook the soup as long.